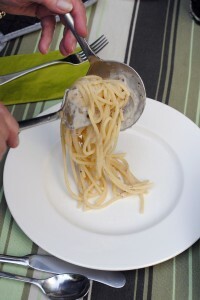 Summer Pasta :: Oracibo.com - Food, Travel, Design and Cooking! When it’s eggplant season…they are so gorgeous, well you just have to cook something with them…so there’s Timballo, Parmigiana, Pasta alla Norma (delish), or even cubed up, sautéed and tossed on to a pizza…and that’s only my Italian favs. Middle Eastern eggplant preparations ring all my bells too! I find that I require 2 – 3 large eggplants, so I do 3 cause I hate running out when lining the mold or if any of the slices don’t quite measure up after cooking…either breaking or whatever. 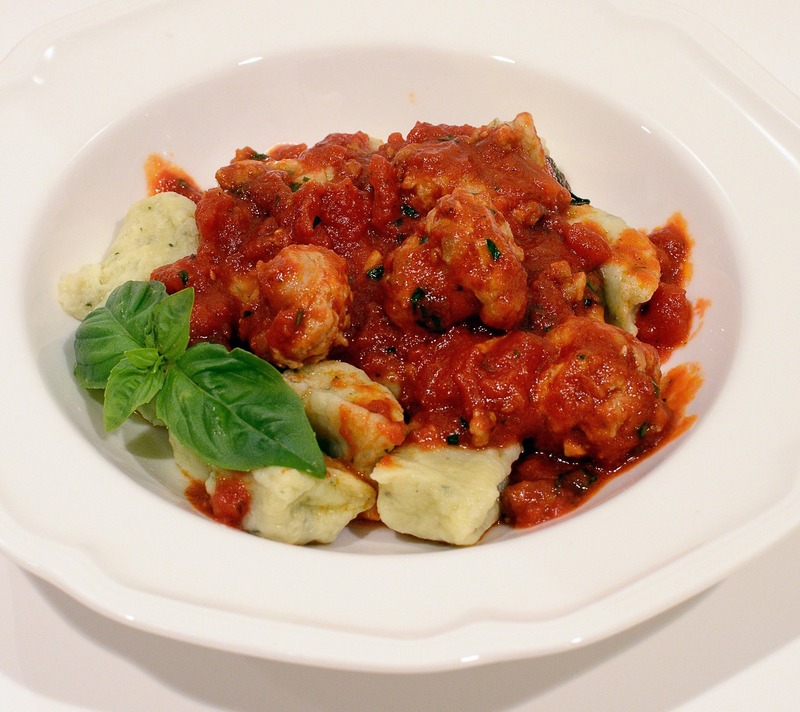 And…the good news is if there’s leftover cooked eggplant…rollatini the next day! Or a quick Parmigiana! To begin you will need an 8” springform pan, buttered & coated with fine, dry breadcrumbs; set aside. 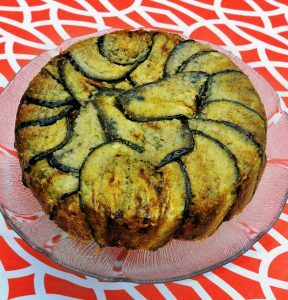 Cut the eggplant lengthwise into 1/8” thick slices, layering in a colander, sprinkling with coarse sea salt between the layers as you go. Set the colander over a bowl & allow to drain for 45 minutes to 1 hr. Rinse well with cold water, drain & place on a large towel. Blot the eggplant slices dry. Place them onto rimmed baking sheets & brush with EVO on both sides. Heat the broiler & broil the slices approximately 4” from the element for anywhere from 2 – 4 minutes per side until golden & not too brown. As the eggplant is broiled, remove from the oven, placing the slices onto paper-towel lined baking sheets & allow to cool. 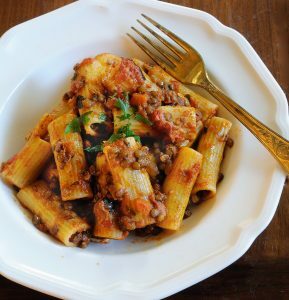 Arrange the cooked eggplant slices in the prepared springform pan so that there is a minimum of a 2” overhang to be folded over once the pasta is added, overlapping the slices as you go. I usually have to arrange eggplant slices in the bottom of the pan afterwards tucking those slices under the ones already in the pan to fill in the middle. Cook the pasta until very al dente. Drain well & place in a large bowl. Add 2 ½ cups of the sauce & the cheese to the bowl. 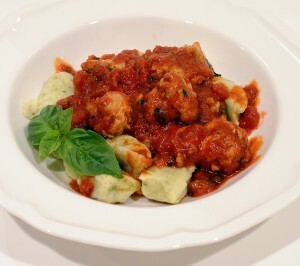 If you are using tomato basil sauce you can add some fresh basil leaves to the bowl. If you are using a meat sauce it is probably well seasoned enough with herbs & spices. Pour the dressed pasta into the eggplant lined springform pan, folding the 2” overhang over the pasta. Place a rimmed baking sheet on the oven shelf below where you intend to bake the timballo & place the timballo on the shelf over it. Bake for approximately 25 – 30 minutes…the eggplant will slilghtly shrink away from the sides of the springform. Allow to cool for 15-20 minutes. 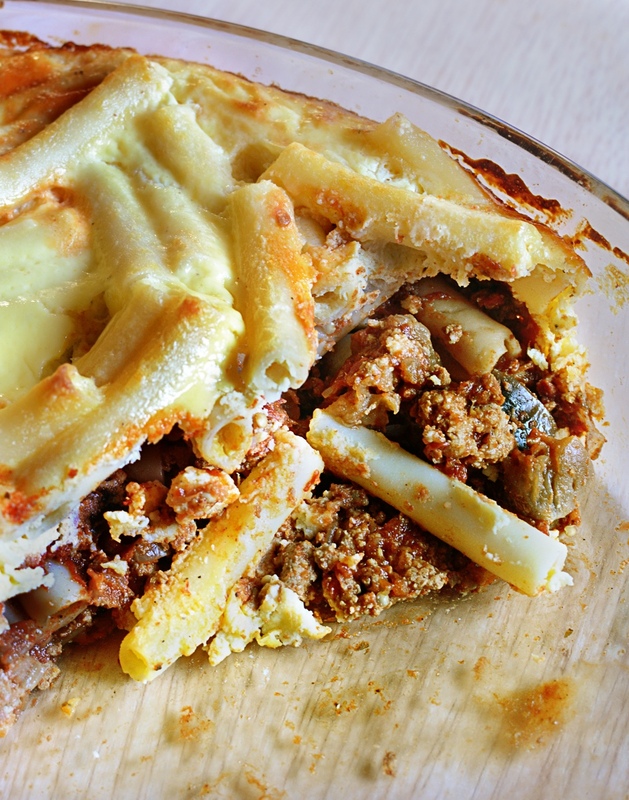 Place a warmed serving plate over the top, invert onto the plate, undo the buckle on the springform, cut Timballo into wedges, serving them with the rewarmed leftover sauce on the side. When the garden puts forth wonderful basil each summer, there are so many delicious choices of things to be made! This version of cavatelli has ricotta cheese in the dough is not quite as soft as potato gnocchi. This “pasta” is another end of summer, last of the basil, dinner in our house! If you have some “OO” flour in the cupboard, you might like to try using it in combination with unbleached flour. If you have a cavatelli maker, feel free to use it, making sure the dough is floured enough so it won’t stick when going through the machine. When I am feeling lazy, I simply cut the raw sausages into 1″ pieces, brown in the EVOO and then continue with the sauce. You could even grill the sausages on the barbecue, cool then cut them up into pieces and reheat in the sauce. In a food processor, with the motor running, drop the garlic through the feed tube. Scrape down bowl with a spatula. Add the eggs, torn basil leaves, & pepper to the bowl; process until mixed; add the ricotta & cheese; process until blended. Add ½ cup of flour at a time, process using on/off turns, just until incorporated, before adding more flour, until the mixture forms a soft, slightly dough. It will be sticky but you don’t want to add too much flour. Remove from the processor onto a flour dusted surface & gently shape into a ball. Place on a flour dusted shallow bowl, cover & chill for 1 ½ hrs. Remove dough from the fridge & divide into 4 pieces. On a very lightly floured surface, roll each into a long tube, approximately 1/2” in diameter. Continue rolling the other 3 pieces of dough. With a sharp knife, cut the ropes into ½” pieces. 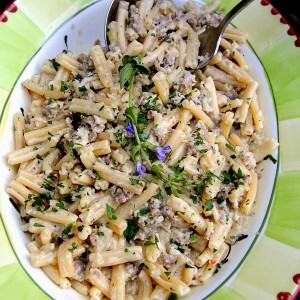 Place the cut cavatelli onto a lightly floured rimmed baking pan, cover & place in the fridge until ready to cook them. In a medium skillet, brown the sausages on all sides. Remove & reserve. Heat the EVOO in a saucepan over medium heat & cook the garlic in the oil for a minute or so without the garlic taking on any colour; add the chili flakes & dried oregano (if using); add the tomatoes & bring to a boil. Meanwhile, cut the sausages into chunks & add to the sauce. Reduce the heat & simmer the sauce about 25 minutes (until thickened), add the fresh oregano, basil & parsley, simmer for 5 minutes. Season to taste with salt & pepper, keep warm. While the sauce is simmering, remove the cavatelli from the fridge & bring a large pot of water to a boil, add 1 Tbsp. salt. Place the cavatelli onto a flat tray in one layer, leaving behind any excess flour & slide them into the boiling water. Give them a stir& in a minute or so they will begin to float to the surface. Cook the cavatelli for a total of approximately 7 – 8 minutes. Have ready a warm serving bowl. With a slotted spoon remove the cooked cavatelli to the bowl; ladle the sauce over & gently give them a stir using a spatula. 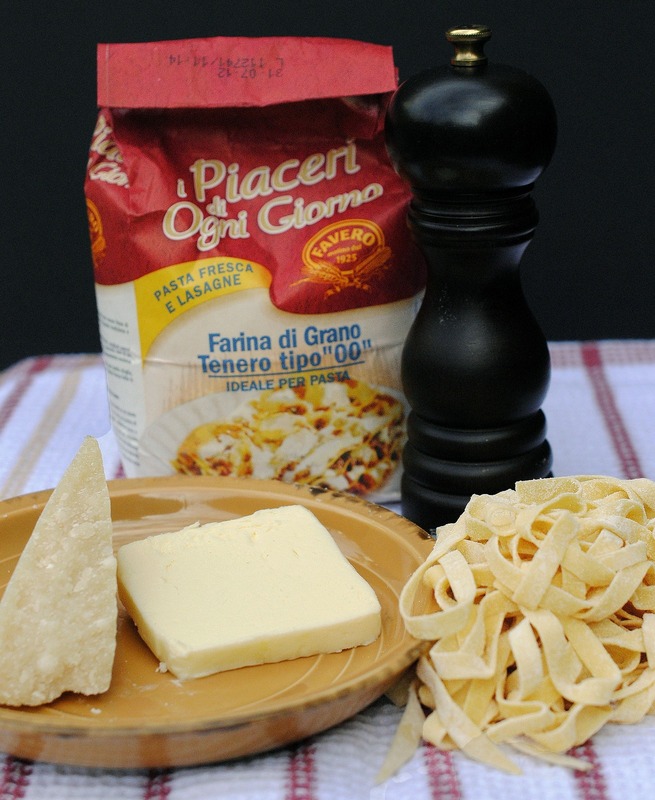 Serve hot, passing either Pecorino or Parmigiano! This is the kind of pasta we enjoy on a hot day! Make the sauce a couple of hours ahead of time, cover and allow to stand to meld the flavours. 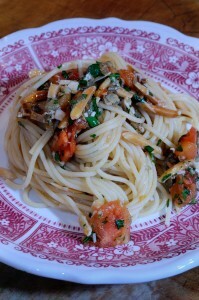 The spaghettini is perfect as a first course with barbecued leg of lamb or chicken or fish. So quick and easy allowing you to lay back and read a good book! You can easily double the recipe too! **Click here to see how to toast the almonds. **Click here to see how to peel the tomatoes. When the almonds are cool, mash the garlic together with the salt; combine the almonds, garlic-salt mixture, tomatoes, EVOO, capers & lemon juice. Set aside until you are ready to make the spaghettini. Bring a large pot of water to a boil. Add 1 – 2 Tbsp. salt, then add the spaghettini & cook until it is al dente, checking for doneness about 2 minutes before the package says; drain & toss the hot spaghettini with the tomato-almond mixture, add the parsley & cheese; toss & serve immediately. 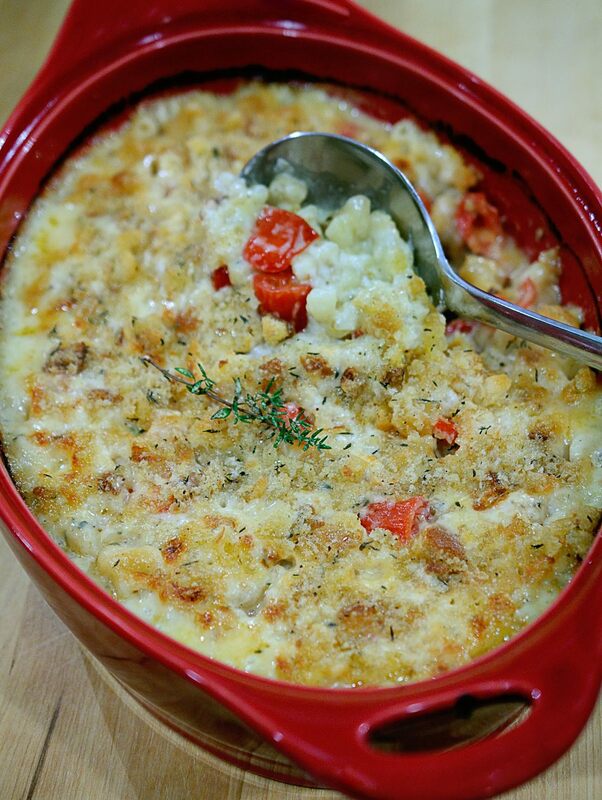 Kid food, childhood memories, bubbly and golden mac ‘n cheese with tomatoes…what’s not to love? Because I adore tomatoes, this is right up my alley and I hope yours too! I like to make this with tomatoes that are available locally right up to the early fall; they are so sweet, juicy & delicious! Combine the breadcrumbs with 2 Tbsp. of the butter that has been melted, along with 1 tsp. of the chopped thyme 1/8 tsp. salt & ¼ tsp. of the pepper. Preheat the oven to 375 F. Grease or spray with non-stick cooking spray, a 3 quart casserole or 9 x 13” baking dish. Bring a large pot of water to the boil. Add 1 Tbsp. salt then add the macaroni, stirring for a minute to keep from sticking. Cook for 2 – 3 minutes (it will not be fully cooked), drain, rinse & set aside. **I like to do this in the microwave but you can do it in a pot on top of the stove. In a very large glass, microwavable bowl, melt the 5 Tbsp. butter on medium (level 5) heat; remove & add the onions; return to the microwave & cook on level 5, in 2 minute increments, until the onions are softened (approximately 8 – 10 minutes. One minute before the onions are done add the garlic & microwave one minute more. Whisk in the flour; return to the microwave for 2 minutes, level 5, until it bubbles a bit; very slowly whisk in the milk; add the nutmeg & return to the microwave & microwave on high for 2 minutes; whisk & continue cooking, in 2 minute increments, until the sauce comes to a boil & thickens. (If you don’t have a large enough bowl; do this step twice, otherwise it could overflow. Once the sauce is done, combine the two, then add the cheeses & seasonings.) Remove from the microwave; add the cheese, ½ tsp. salt, ½ tsp. pepper, remaining 2 tsp. chopped thyme & Tabasco, whisking until the cheese is melted. Stir the macaroni & tomatoes into the sauce. Pour into the greased casserole; sprinkle with the buttered breadcrumbs; bake until bubbling & golden, about 30 minutes. Let cool for 5 minutes or so before serving. **To make the breadcrumbs, please see How To Make Breadcrumbs. Everyone in Italy, I’m sure, has their own recipe for this pasta! I may not live there but I am growing the Romanesco zucchini. 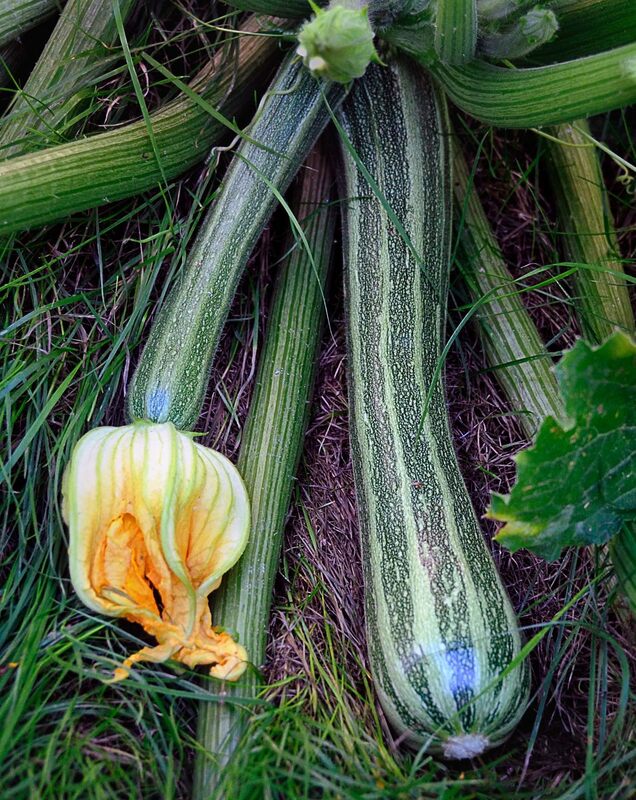 Here’s my take…it’s quick and simple but very tasty. Bring a large pot of water to the boil. 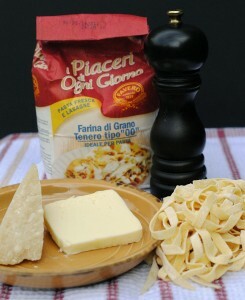 Add the pasta to the pot & cook until al dente (this will take between 8 – 10 minutes). Meanwhile, heat a large sauté pan over medium heat; add the EVO & heat until hot but not smoking. Add the diced pancetta & cook until it just begins to colour; add the slices of garlic & the zucchini; sauté for 4 minutes; stir in the chili flakes. When the pasta is cooked, reserve ½ cup of the pasta cooking water then drain the pasta. Add ¼ cup of the reserved water, the basil & half the Parmigiano to the pancetta, garlic, zucchini mixture & stir, then add the farfalle to the pan; tossing to combine; adding more of the reserved pasta water if it appears too dry. The sauce should coat the farfalle & not be “saucy”.